You can visit the ClipFlair Activity Gallery where you can search for activities based on rich metadata. Here is a Quick Guide to Voiceover, Dubbing and Subtitling kindly prepared by Andrea Simón and Silvia Fernández. It includes instructions on how to use ClipFlair. Critical Commons is a public media archive and fair use advocacy network that supports the transformative reuse of media in scholarly and creative contexts. 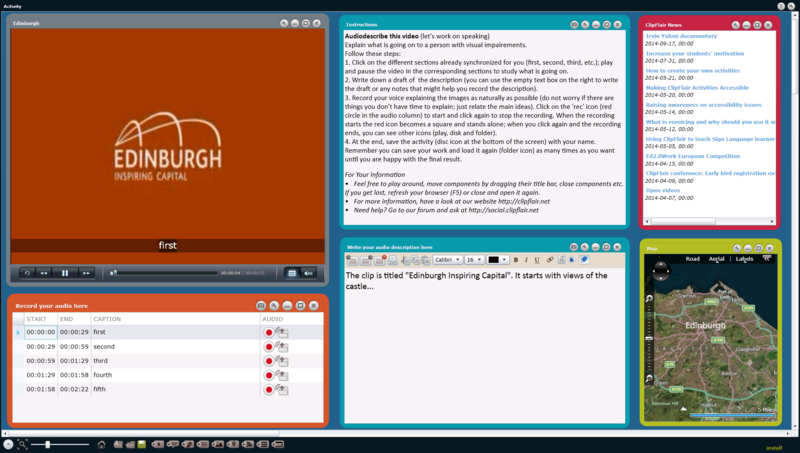 You can find many clips there for your language learning activities! Let's create captions for our hard-of-hearing friends who 'd like to watch this documentary trailer about Irvin Yalom, the world-famous psychiatrist and writer. With this activity your students of English will practice listening and writing skills and your effort will have a tangible, shareable result: the subtitled clip. a. Go to the Activity Gallery and choose the filter For learners of > Any language. You'll see a number of activities, pick one and open it. b. Modify the activity to fit your needs (e.g. translate the instructions, add or remove text components etc). c. Save it in your computer. a. Go to the Video Gallery and use the filters to choose a video and open it. b. Add a text component with instructions and a captions or revoicing component according to your needs. Follow the steps c-e described in method 1 above. a. If you don't need your activity in the Gallery, just create a new activity with the Studio, and drag and drop your clip there (from your PC). When sharing, make sure to send the video together with the activity, because the clip is not saved in the .clipflair file (for file size economy). b. If you'd like your activity in the Gallery, first post your video (Creative Commons License preferred) in the Feedback forum > Suggest Material > Video. c. After we have published your video in the Gallery, follow the steps described in method 2 above. How about giving learners a chance to practice audiovisual listening and writing skills while raising awareness on accessibility issues? 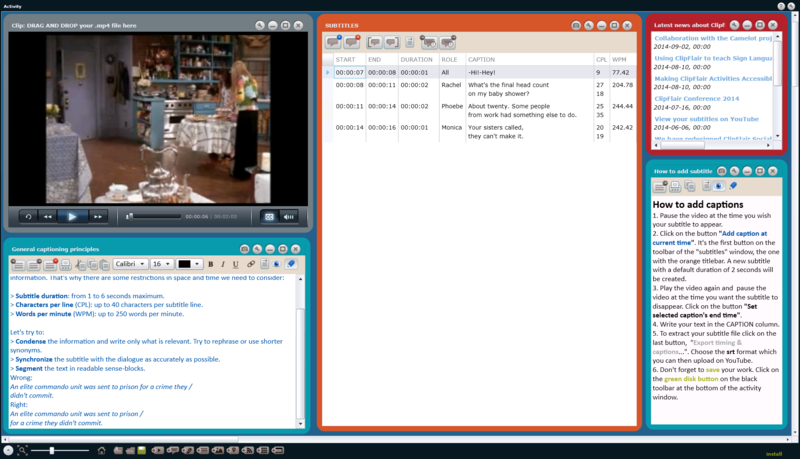 In the ClipFlair activity Baby Shower, B2 students are asked to simulate the work of a subtitler for the deaf and hard-of-hearing and add captions to a clip from the popular series Friends. To do that, first they need to listen carefully to the dialogues and transcribe them. 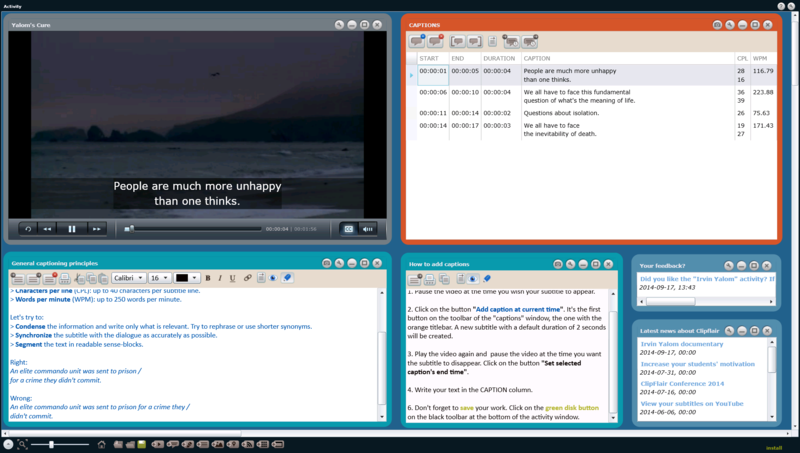 Then they have to create subtitles by following certain subtitling standards. 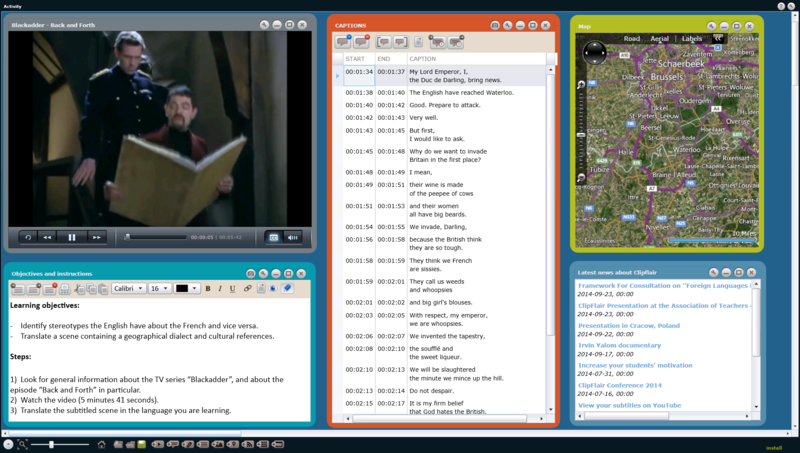 Time and space restrictions often do not allow for a word-for-word transcript, and condensation is necessary: learners have to find shorter synonyms or paraphrase the script to fit it in the subtitles. 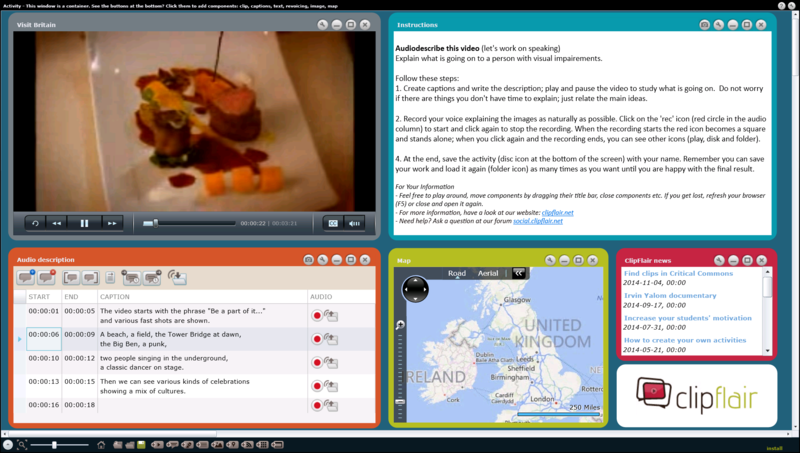 Language teachers could enter the Ed2.0Work European Competition using ClipFlair! The idea of the competition is to share the best ideas of the use of free Internet and mobile technologies across education globally. This is your chance to show your great ideas for teaching to the world, we can’t wait to see what you are doing. The competition asks teachers to make short (2.30 minute) videos about the practice and technology they use. There are prizes in the form of Amazon book vouchers and the overall winner will have an expenses paid trip to present their idea at the Ed20Work final conference in Glasgow on November 20 and 21 2014. There are also Logos that you can include on your websites, or blogs and all correct entries will receive a Certificate of Entry. The video results of the competition will be added to the repository of resources of the Ed20work project and also saved on YouTube.